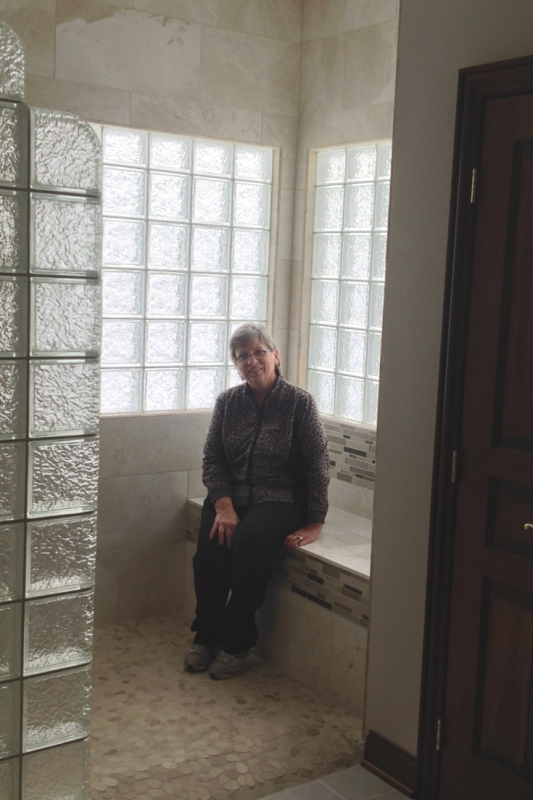 Gabi Karpowicz was faced with a challenge – how to redesign her master bathroom (located in the Hilliard suburb of ColumbusOhio) to add style, make it easier to safely care for her mother in law and increase the total functionality of the space. 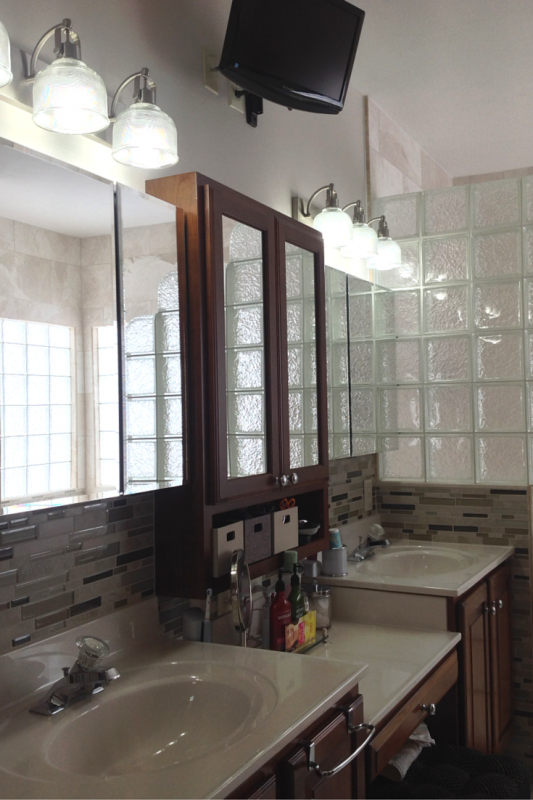 Learn below how Gabi and her husband Joe (along with Columbus Glass Block division of Innovate Building Solutions) used 7 different space and product selection strategies to elevate the functionality, design and style of this master bathroom without having to totally redo the space. Strategy 1 – Eliminate unused “accidents waiting to happen” (the jetted tub) – Like many upscale homes built 20 years ago this home had a mammoth 50” x 50” jetted tub which was unused, difficult and dangerous to get into and out of. The plan – reclaim this space with a roll in barrier free shower to not only take the stress out of helping her mother in law out in the shower – but would provide an age in place long term showering solution as well. Strategy 2 – Keep what’s nice, but design it to be better – While the existing bathroom had beautiful cherry cabinets and low maintenance large ceramic floor tiles – it lacked storage. Expanding storage involved removing the old full length flat glass mirror over the cabinets and replacing it with two mirrored medicine cabinets and a custom built cherry and glass cabinet. 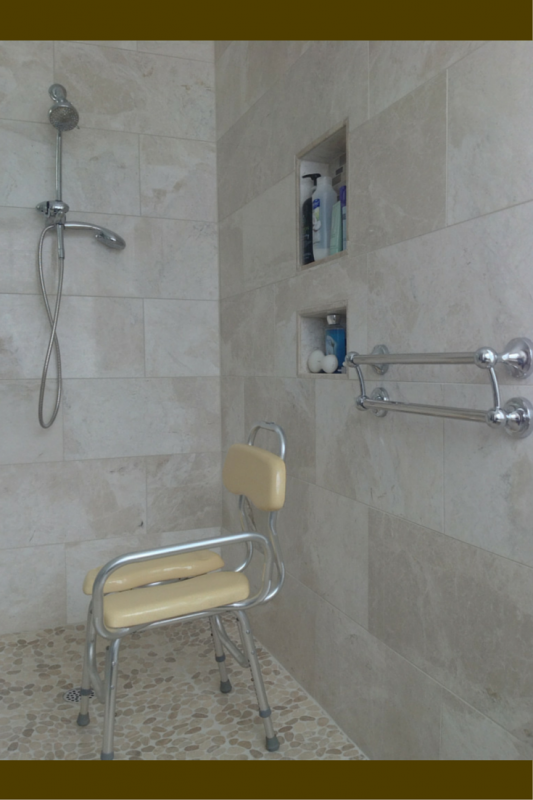 Strategy 3 – A shower base design which works for everyone – The new design had to work for Gabi’s mother in law and provide safe wheelchair access and offer a luxurious showering experience for Gabi and Joe. The solution used a 36” wide ramped waterproof barrier free ready for tile shower base (the total size was 116” x 54”) which was installed by thin setting it to the subfloor. 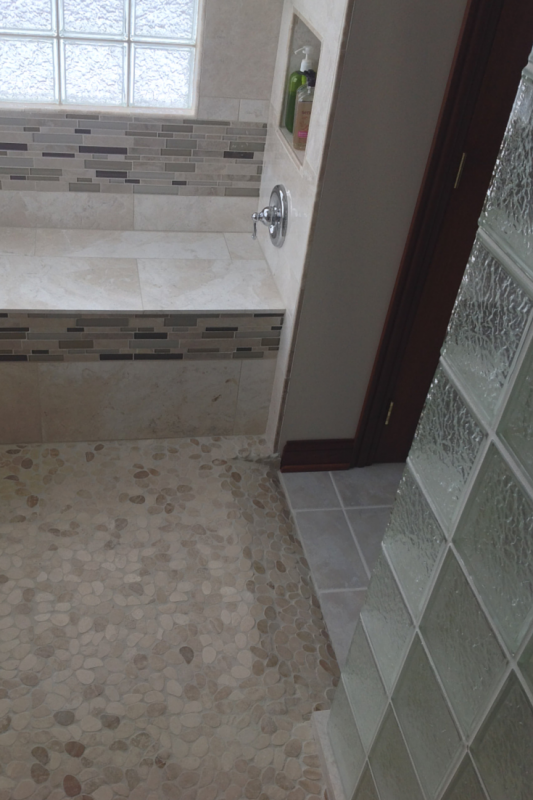 The pebble mosaic tiles provided a fun finished look. Strategy 4 – Two high privacy, light transmitting glass block shower windows – Once the jetted tub was removed from the corner of the room something had to be done to provide privacy for the large 40” x 46” 1st floor windows which are now located inside the shower. 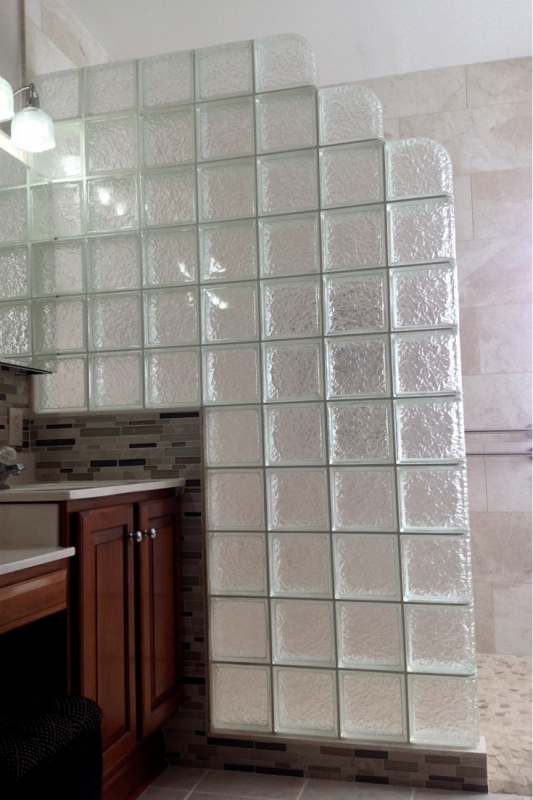 Two “icescapes” pattern (from Pittsburgh Corning) glass block windows were selected. The extra light realized by eliminating the old blinds enhances the aging in place goal by boosting natural light from these south and west facing windows. Strategy 5 – Remember the 3 P’s – perfect product placement – Where accessories are placed has a huge impact on the performance of age in place shower. 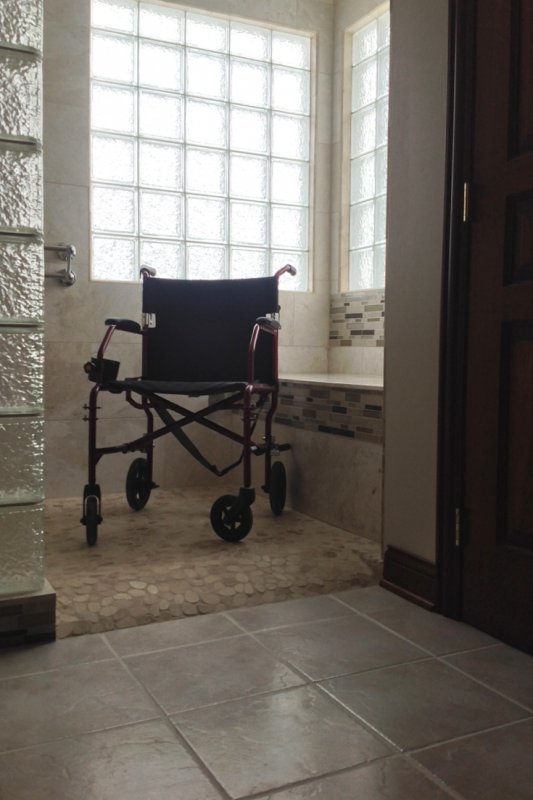 The valve was located by the entrance to provide the ability to warm up the water before entering the shower, recessed niches were lowered to allow access for Mom from her shower chair and roll out closet shelving trays offer easy access for everyone. Strategy 6 – Use low maintenance, high style materials – A prefabricated and ready to install Protect All glass block shower system (supplied and installed by the Columbus Glass Block division of Innovate Building Solutions) offers a sturdy stylish glass enclosure which is easy to clean and uses very tight 1/8” grout joints. The 12” x 24” Crema Bella polished marble shower wall tiles are quite sophisticated and easy to maintain with their thin 1/16” joints. Strategy 7 – Make stylish and safety synonomous – The hand held Moen sliding shower head and the decorative grab bars (which double as towel holders) provide style, sophistication and safety. Which of these 7 strategies could make the biggest impact for your age in place shower? Comment below or call the following numbers for more information on the products and design strategy for this project. For more information on various roll in showers or glass block shower and window systems call Innovate Building Solutions (877-668-5888) nationwide. 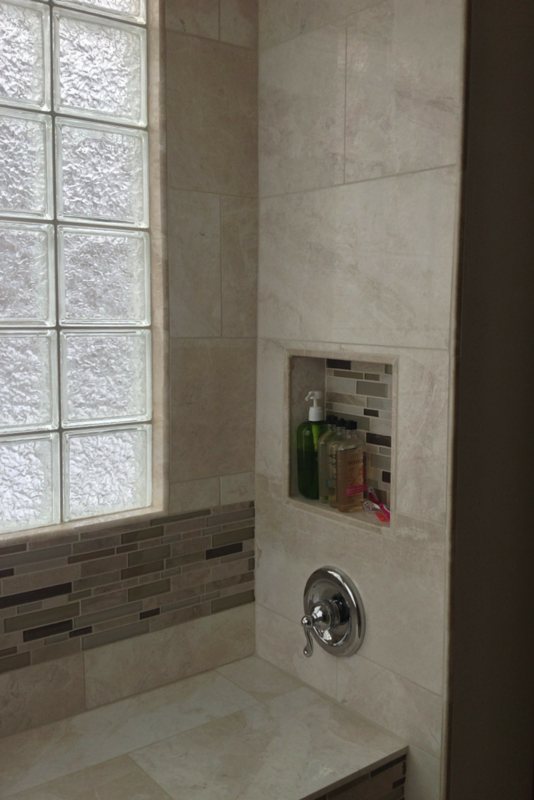 For regional installation assistance for glass block windows and showers contact Columbus Glass Block (614-252-5888) or Cleveland Glass Block (216-531-6363). 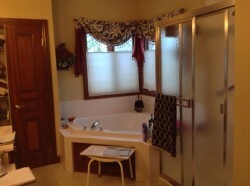 For assistance with a complete remodeling job in Cleveland call Cleveland Design and Remodeling at 216-658-1270.